It has been a long time coming, but I am very excited to announce the opening of Branches S-635 and J-537 in Wichita, KS. 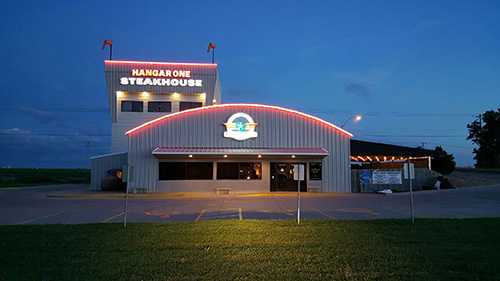 The grand opening dinner took place on June 16, 2015, at Hangar One Steakhouse. Congratulations to agent Cliff Cross and the members in Wichita!!! I am a person who likes to be and has to be organized. I always work ahead on projects at work so I am not scrambling at the last minute. I take pride in always being early for a meeting, dinner, etc. I had planned out my flight so I would arrive in Wichita around 2:15 pm. That would give me plenty of time to get my bags and rental car, check into my hotel, change clothes and freshen up before the opening Dinner at 6 pm. I had planned to get to the restaurant around 4 pm to get set up before my dinner guests / FCSLA members arrived. Sounds like a good plan, right? Mother Nature didn't think so. I get a notice on my cell phone from the airline at 5 am saying my 10:44 am flight was delayed. Okay, no big deal; it was leaving a little later, but I would still get to Wichita in plenty of time...or so I thought. I finally left Cleveland at 2 pm. I had to go through Chicago O'Hare. Well now I have missed my connecting flight. Next flight out of O'Hare to Wichita is 4:30 pm. It's about 1 hour and 20 minute flight. I am scheduled to land in Wichita at 5:50 pm. I finally landed at 5:55 pm. Then I hope that my luggage found its way with me. I wasn't so concerned with my personal luggage, I was worried about the duffle bag that had all the "goodies" for me to pass out at the dinner! Both arrived with me! I arrived at the restaurant at 6:30 pm. I hate being late. Once again, I would like to apologize to Cliff and all the wonderful members for arriving "as is" straight from the airport. I like to dress in appropriate attire when I meet our members. They got me in jeans and a Dolphin Tales 2 t-shirt (I like to travel in comfy clothes). Once again, thank you all so much for your warm reception when I arrived. And thank you for bearing with me as my agenda for the dinner pretty much went out the window. Thank goodness Cliff "filled in" for me and got the dinner rolling. Thank you Cliff! I hope you all enjoyed your dinner (I thought the food was excellent) and the restaurant was pretty cool. We had a room all to ourselves. I think the name says it all. I wish I would have been able to talk to more of you one on one like I usually do. Your branch is going to do very well from the conversations I did have. As I write this article, we do not have branch officers yet, but I am confident we will have 2 or 3 very soon. I know it can sound a bit overwhelming, but it won't be. Once you get all the initial set up done it will be fun. I am always a phone call away, and, if needed, I am willing to come out and see you again. Maybe we could wait until next year, though. I do need to add that your new airport is beautiful!!! I also wanted to thank agent Shawn Hopkins for coming to the dinner. Overall, the evening (once I got there) was great! Congratulations again to Cliff for all his hard work over the past few years! Now the fun begins with branch activities, matching funds projectssky's the limit! Welcome to the FCSLA family branches S635 & J-537! P.S. I won't even tell you about my trip home the next morning (it was even worse than the trip there). I am still smiling!!! 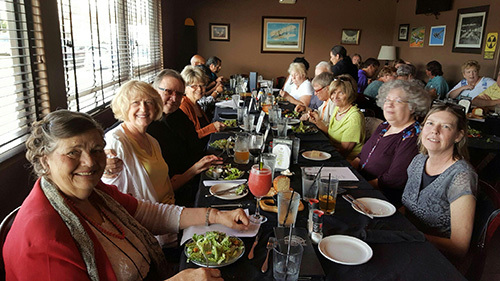 See more recent FCSLA activities.